MacDonald recognized the potential of being transformed by stories—that the reader or listener could learn within the framework of the story itself. He believed that readers could come to a better understanding of God if what they read was shaped by “Sacred Story"—both Scripture and the stories influenced by Scripture. He believed that an understanding of the intrinsically relational God could not be grasped outside of a relational hermeneutic; that a list of dry propositions would never be able to convey what the fullness of story—story rooted in Sacred Story—could. This is a surprisingly contemporary conviction, and yet one as old as Genesis. For MacDonald, it is also as relevant as Genesis. What pastor does not know that if one desires to grab the attention of every tired and pre-occupied person in the pew, a story rarely fails? And that the story might be the only thing listeners remember the following week? Unfortunately, this is often seen as a failing of the people. Yet from the very beginning Scripture is filled with stories and references to them. Indeed there is more story in the Bible than any other genre. George MacDonald grew up in a culture that placed great value upon story—and immense value upon knowing the Bible in its entirety. He was also gifted with an education that introduced him to a wealth of storied literature, not only the stories of ancient Scotland but those of ancient Greece, the Norse myths, the French ballads, and the German Mãrchen (fairy tales). In Mallory, Dante, Chaucer, Milton, Spenser, Goethe, Shakespeare, and Bunyan, he discovered profound stories that were shaped by and responded to Scripture. He found the same in such poets as Herbert, Crashaw, and Sidney, and in contemporaries such as Coleridge, Zola, and Tolstoy. Writers like these continually showed him new perspectives on old stories and taught him how to face the challenges of human existence, how to live life more abundantly by better knowing his God and creation. The more time he spent journeying with the characters of these texts, the more they challenged and equipped him. But MacDonald was also very aware-as both the Bible and his favorite authors made absolutely clear—that nobility of thought is nothing without nobility of deed. Spending all of his time within these great texts would truly teach him about life, yet if he did not act upon what he was learning, the knowledge would poison him. MacDonald makes considerable effort in his novels to illustrate this. In Lilith he shows how the protagonist Vane has spent his life within the confines of mental exploration, not risking the complications or rewards of human relationship, not deigning to admit a need of others. As redemption begins to occur, Vane learns to say, “To understand is not more wonderful than to love. . . . I had chosen the dead rather than the living, the thing thought rather than the thing thinking! ‘Any man,’ I said now, ‘is more than the greatest of books! '” A significant part of Vane’s journey has involved discovering that knowledge without relationship is death. This is a persistent theme for MacDonald, perhaps depicted most chillingly in the seemingly affable scholar Uncle Stoddart in Annals of a Quiet Neighbourhood. Annals is a novel that even today draws readers to consider entering the ministry. Following the journey of an inexperienced minister named Walton, the reader discovers the subtle and surprising ways in which God meets him. Over time Walton learns that despite Stoddart having considerably more knowledge than anyone in the parish, he is severely lacking in wisdom. Indeed, the minister learns, the wisest parishioners are sometimes those most easily overlooked, not the best read. Walton is also surprised to find that the greatest moral support sometimes comes from the most wary agnostic, and the greatest love from those who seem least likeable. MacDonald is showing wisdom learned through his own experiences, as well as wisdom learned through his mentors—personal, literary, biblical. And in the very crafting of the story he shows how Walton learns the same. MacDonald is not shy to point out those whose stories and poetry have shaped his writing, worldview, and God—view. In his adult novels—even the fantasies—he frequently names writers he believes worth reading. In David Elginbrod he refers to over 90 different works of literature, and this is not exceptional. MacDonald frequently has characters in his stories introducing companions to good literature, even giving tutorials meant to tempt us, as readers, with gems awaiting discovery. But his references are by no means always explicit. This is perhaps most evident in MacDonald’s fantasy. The Princess and Curdie is one of MacDonald’s most popular tales. Like Annals, it is about ministry—and being ministered to. For those who wish to relegate Noah, Daniel, and Jonah to the Sunday schools, perhaps it is nothing more than a tale told for children. But in imitation of his Master, MacDonald believed that good stories were for all-and poor stories for none. On the surface, this is a classic tale about journeying and serving, about faith and trust. But reading it in light of Scripture, paying close attention to particular phrases and imagery, reveals even greater richness. Each layer of meaning does not reduce the power of the story—as is proven by its “classic” standing—but imbues it with wealth. Furthermore, MacDonald follows the lead of all enduring tales, in that his novel addresses the concerns of his own era, concerns which—cloaked with historic particularity as they may be—remain perpetual. The sacred story that provides the framework for Curdie is a text particularly renowned for its immediate and enduring pertinence: Isaiah. While many other parts of the biblical corpus (as well as many works of classic literature) color MacDonald’s story, it is Isaiah that predominates. Curdie, a young miner, finds himself before a royal presence, professing his own errant ways, and thus being prepared to recognize those of his people. Like the prophet Isaiah who courageously offered, “Here I am, send me,” so begins Curdie’s adventure, filled with the same refrains and images: people in darkness see a great light, wine is poisoned, fires refine, animals harry courtiers, the widow and orphan are rejected, the stranger is reviled and beaten . . . even obscure passages of Isaiah have their parallel in Curdie, such as a caterpillar meting out justice and a flock of doves on the defense. Literary critics have worried and puzzled over the ending of Curdie for decades (an ending that bothers few children) and yet the source and explanation lies firmly ensconced in Isaiah. But MacDonald is a pastor, not merely an exegete, and he wants his readers—whether they are aware of it or not—not only to understand Isaiah better, but to learn how relevant the text remains to the troubles of their very own age. Not only did MacDonald show, through Curdie, the relevance of Isaiah to the Britain of his time, but he simultaneously addressed some of the contemporary crises of faith. Debates about historical criticism were raging, and concerns over the accuracy of translation, biblical authority, evolution and the age of the earth were shaking the spiritual foundations of some ministers and laypersons. The complexities of the text of Isaiah, along with its occasional designation as “the fifth gospel,” resulted in its becoming a popular test case for critical study. MacDonald was among those Christians who did not find the discoveries of science and anthropology disturbing. Rather than seeing them as “explaining away” the supreme authority of God, he saw the questions they raised as widening and deepening the vastness of God’s mysteries, showing him to be even more incredible than man had become comfortable conceiving. And so MacDonald begins Curdie with a love song to the geological glories of the evolution of a mountain. He did not see science as antithetical to his faith in any way, but believed instead that both science and poetry were dimensions of the same truth. In an essay explaining this union, MacDonald wrote of a young poet lost in his inability to grasp that true science and true poetry cannot be at odds. This poet could well be a young Matthew Arnold, and Curdie an attempt to redress some of his angst. Arnold, whom MacDonald called a “reverent doubter,” was one of the dissenting voices of biblical criticism. Today he is best known for his poem “Dover Beach,” which laments his loss of faith. This poet was in a bind, for though he loved literature, he felt that it must be subservient to the new glory of science. In multiple studies of Isaiah, including one for children, Arnold wrote of the importance of the beautiful biblical text—but also of his resigned acceptance that its value lay in its historical and moral virtues, and that “extra-belief” in Scripture was only misleading. Actually believing in the Bible, he said, was no better than believing in fairy tales. For he has come, The Word of God, that we may know God: every word of his then, as needful to the knowing of himself, is needful to the knowing of God, and we must understand, as far as we may, every one of his words and every one of his actions, which, with him, were only another form of word. I believe this the immediate end of our creation. MacDonald realized that a crucial element had been left out of the dialogue: the essential “story-ness” of the text. And so, in an attempt to explain the complicated poetic story better, as well as to counteract reductionist voices such as Arnold’s, MacDonald explored Isaiah in its own storied form. In giving The Princess and Curdie greater depth and purpose through the stories that shape it, MacDonald was following a time-honored tradition—a tradition that has produced Western literature’s greatest classics and some of Christianity’s most profound texts. While doing this he also responded to the quandaries of his contemporaries such as Arnold, who feared that science and Scripture must be antithetical. MacDonald was not threatened by the questions posed by his culture; he understood the need to ask them. But he sought to present a better answer—to show, through its own medium, both the enduring relevance and the enduring adequacy of the biblical text. MacDonald uses story in the manner modeled by Scripture "that we may know God.” Knowing the vicarious educational nature of stories, he pastors his readers by “waking them up” to the incredible grace of God’s love. All of his stories seek to convey this truth, as he explores death in At the Back of the North Wind, obedience in The Wise Woman, and the process of becoming more fully human in Sir Gibbie (the source of that marvelous phrase about learning to live “in the holy carelessness of the eternal now"). The testimony to God’s love is there in Paul Faber as a man struggles powerfully with forgiveness and pride, and in Heather and Snow as grace and divine teaching are granted by a youth with mental disabilities, who also continues to grow in his own understanding of the “Father of Lights.” Robert Falconer allows the reader to ask uncomfortable questions and to observe a soul wrestling with grace, while Salted with Fire condemns the refusal to offer grace and shows how desperately everyone needs it. “The Golden Key” reminds the reader that people may have different experiences of faith, yet no journey can be independent of others. It also shows how God’s creation and the “faith of our fathers” can be gifts in the journey. Kirstin Jeffrey Johnson is a doctoral student at the University of St. Andrews, Scotland. The Jerusalem pilgrimage of Lethbald. Samuel Taylor Coleridge and William Wordsworth translated Romantic ideals into the language of Christian experience. 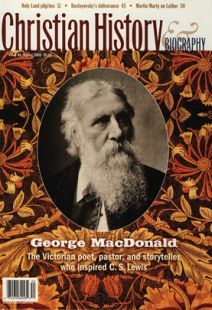 George MacDonald’s friends worked to reform society, challenge the church, and inspire the imagination. Fyodor Dostoyevsky, Alexander Solzhenitsyn, and John Bunyan.